We are NOW offering half day and full day charters with a United States Coast Guard License Captain. We promise to teach you how to fish, how to release a fish, educate you on various offshore species and have a bunch of fun. We do not care if you have never fished before, we will teach you everything you need to know. The best way we can ensure that our offshore species will remain in a healthy population is to educate everyone on how fun fishing is and how to conserve our resources. Ok enough of all the rules. 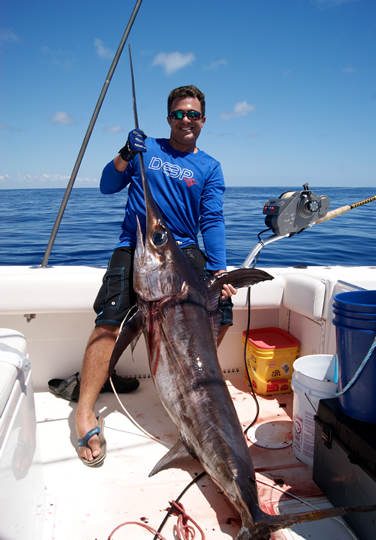 If you really want to Fish Offshore, catch your first first or your most memorable fish including tuna, dolphin, albies, kingfish, wahoo, swordfish and sailfish and many of the other species around than email Grant and lets GO! We WILL teach you everything you need to know about this fantastic sport! If you are concered with getting sea sick-DONT BE-if you dont feel great we will have you back on dry land in 15 minutes. Remember we are not a charter boat, we are merely teaching people how to fish so we are not concerned with how much fuel we burn. If you dont feel well, we will take you home. This is all about fun and education. Our sponsors make all this possible. They provide many of the products you will use when fishing with us. These are companies that believe in what we are doing and are putting profits aside to contribute to your education of fishing and conservation of our fisheries. Place in the title of the email “I want to fish.” Be sure to include your name, phone number and dates you wish to fish and Grant will call you.